In Business Practices, A Penny of Pragmatism is Better than a Pound of Idealism. As the saying goes, “One Man’s Meat is another Man’s Poison.” Nothing can be claimed to be ‘HEALTHY’ until man experiences the consequences of the food he consumes. WHOLE FOOD – WHOLE IDEALISM vs WHOLE PRAGMATISM: THIS IS A PRAGMATIC INQUIRY ABOUT THE RELATIONSHIP BETWEEN A CONSUMER OF FOOD, THE FOOD RETAILER AND THE PHENOMENA OF HEALTHY LIVING. This article makes a pragmatic inquiry about the relationship between a consumer of food, the food retailer, and the phenomenon of healthy living. 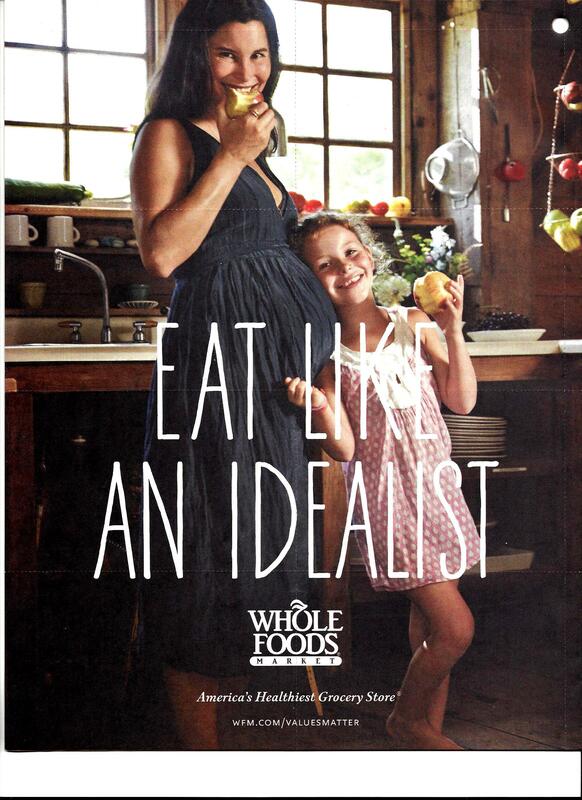 WHOLE FOOD – WHOLE IDEALISM vs WHOLE PRAGMATISM : WHOLE FOODS LAUNCHED A NATIONAL ADVERTISEMENT CAMPAIGN INTRODUCING THE CONCEPT OF “IDEALISM” IN EATING. PRAGMATISM DEMANDS KNOWING ACTIONS THROUGH THE EXPERIENCE OF CONSEQUENCES. THIS PHOTO IMAGE MAY SUGGEST THAT PREGNANCY IS THE CONSEQUENCE OF A NATURALIST LIFESTYLE WHICH INCLUDES THE PRINCIPLES OF IDEALISM IN EATING OR EATING LIKE AN IDEALIST. Whole Foods only sells products that are “natural” which the Company defines as minimally processed foods free of hydrogenated fats as well as artificial flavors, colors, sweeteners, and preservatives. 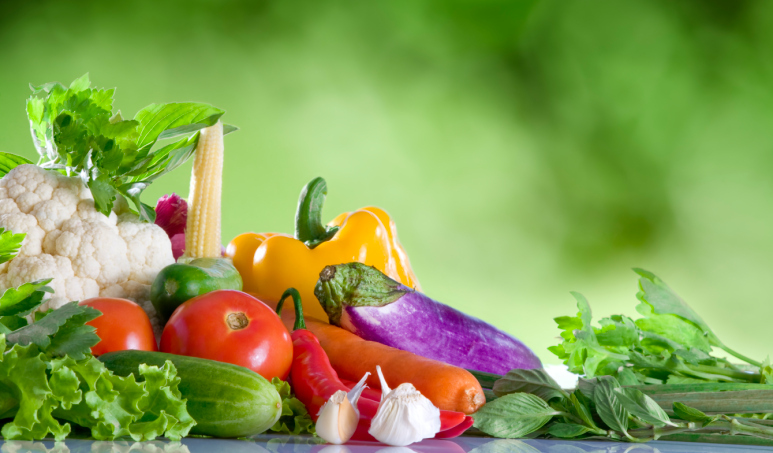 Apart from selling fresh conventional and ‘organic’ fruits and vegetables, it offers prepared foods with “healthy” ingredients and clear labeling. Whole Foods specializes in products produced or grown locally, grass-fed meats, organic ‘free-range’ chicken, just-caught seafood and a variety of bakery items. ‘HEALTH’ magazine published by TIME Inc. Network had asked five nutritionists and a pediatrician to review 35 largest food retailers across the country and announced ‘America’s Healthiest Grocery Stores.” In her opinion, Ms. Kate Geagan, MS, RD, a nutrition consultant, Park City, Utah speaking about Whole Foods stated: “It’s the Rolls Royce of healthy eating.” Dr. Alan Greene, MD, Clinical Professor of Pediatrics, Stanford University School of Medicine, Palo Alto, California, the chief panelist of HEALTH magazine’s study, confirmed that “Whole Foods has the Whole Package.” In his expert opinion about Whole Foods and its relationship to health of people, Dr. Greene claims, “The Store celebrates great, healthy food from start to finish.” It must be clearly recognized that Dr. Greene and his panel will not be able to publish their findings in any Medical or Science Journal. Such a report that grades grocery stores in terms of health value will be outright rejected for there is no observational evidence to support the claim. To make a cause and effect relationship between a food retailer and the health of a food consumer, the supporting evidence can only come not by simply looking at the products available for purchase at a given store but by making proper health assessments of the consumers over a period of time. Having won this endorsement from Health magazine and its panelists, Whole Foods has registered the phrase “America’s Healthiest Grocery Store” as its TradeMark. In my view, the conclusions of the study conducted by HEALTH magazine lack the validity or objectivity of Science. The methodology used by the six panelists of HEALTH magazine does not involve measurement of objective criteria for assessment of health and there is no experimental verification and validation of their findings. This hypothesis, this mental concept of “America’s Healthiest Grocery Store” must be tested, verified, and be validated without using the subjective experiences of the investigators. I am stating that for this “HEALTH” evaluation, data must be collected with precision, accuracy, and consistency after establishing objective standards for the observations. For the reasons that I mentioned, the study and the findings of the expert panel sponsored by HEALTH magazine have utterly failed to demonstrate a relationship between their claim and the observational evidence. Their conclusions about “America’s Healthiest Grocery Stores” would be mere conjecture, surmise, guesswork, or wishful thinking, or amounts to speculation for their judgment or estimate is not supported by actual knowledge or enough facts for certainty that concern the central issue of the health condition of people who consume food sold by the food retailers that are investigated. 5. The substance that provides the spiritual basis for man’s relationship with Divine Providence and thereby preserves man’s Spiritual well-being. WHOLE FOOD – WHOLE IDEALISM vs PRAGMATISM : THE RELATIONSHIP BETWEEN THE FOOD CONSUMED, AND ITS EXPERIENCE(THE CONSEQUENCES FROM ACTUAL CONSUMPTION OF FOOD) IS IMPORTANT. STILL, A FIRM RELATIONSHIP BETWEEN “YUMMY” FOOD AND HEALTHY LIVING HAS TO BE PRESENTED USING DATA THAT CAN BE VALIDATED AFTER VERIFICATION. 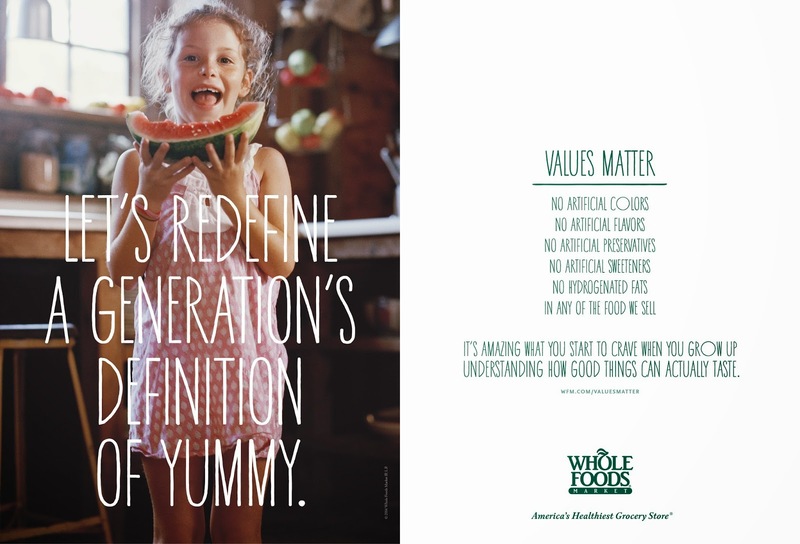 THERE IS NO ESTABLISHED SCIENTIFIC DOCTRINE THAT UPHOLDS THE “VALUES” THAT MATTER IN THE IDEALISTIC VISION OF WHOLE FOODS. WHOLE FOOD – WHOLE IDEALISM vs PRAGMATISM : WHILE STANDARDS COULD BE USEFUL GUIDELINES, SOMETHING COULD BE SAID TO BE TRUE IF AND ONLY IF IT COULD BE VERIFIED BY LOGICAL OR SCIENTIFIC PROCEDURES. IF A THING CAN BE SAID TO BE TRUE, SCIENCE EXPLAINS AS TO WHY IT IS TRUE. Whole Foods is buying TV advertisements during network and cable shows such as The Tonight Show with Jimmy Fallon, The Saturday Night Live Show, Jimmy Kimmel Live Show, ‘SCANDAL’, ‘MODERN FAMILY’, Thursday Night Football, and others. Whole Foods has shown a strong commitment to sustainable agriculture, supporting organic farmers, growers, its vendors, its suppliers, and the environment. Whole Foods has a preference to market products that are considered to be environmentally friendly and ecologically responsible. 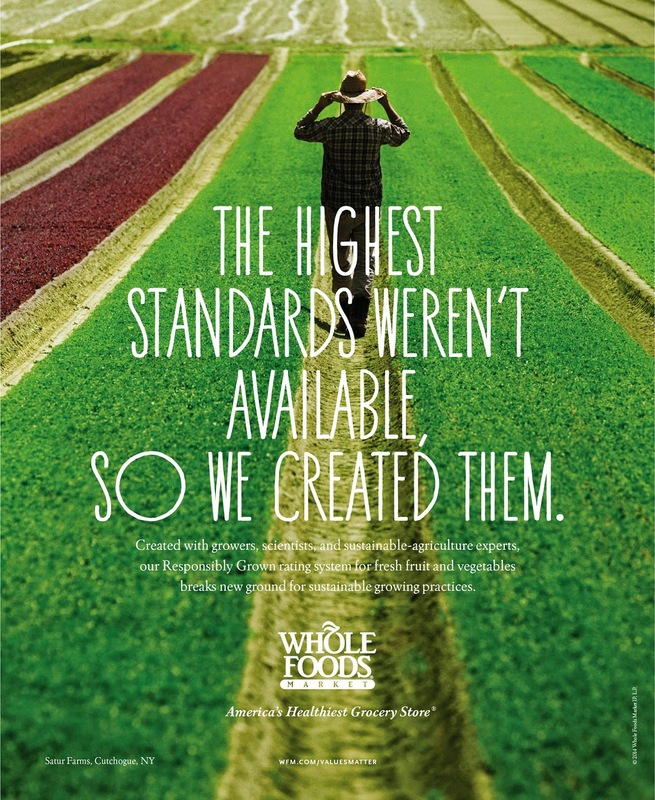 Whole Foods has formulated strictest quality standards for all the products that it sells and has evolved its guidelines for Animal Compassion, Sustainable Seafood, and Produce Production standards. While Whole Foods is engaged in promoting its idea or vision of raising the level of Food Consciousness, I would like to introduce to my readers the concept of ‘PRAGMATISM’. WHOLE FOOD – WHOLE IDEALISM vs PRAGMATISM : DR WILLIAM JAMES(1842 – 1910), PSYCHOLOGIST AND PHILOSOPHER WHO TAUGHT AT HARVARD UNIVERSITY. HE STATED THAT THE TRUTH OF A PROPOSITION IS JUDGED BY ITS PRACTICAL OUTCOME. 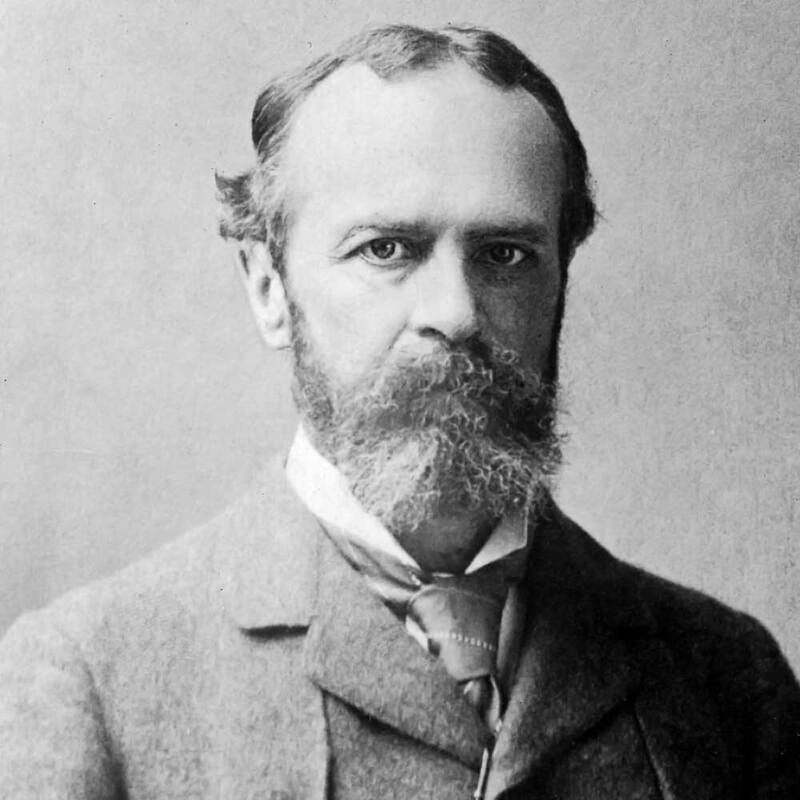 William James is best known for his books, Principles of Psychology(1890), and Pragmatism(1907). Pragmatism is a method of philosophy in which the truth of a proposition is measured by its correspondence with experimental results and by its practical outcome. Pragmatism finds merit in ideas, policies, and proposals by using criteria such as their usefulness, workability, and practicality. Pragmatism stresses the priority of action over doctrine. Pragmatism places value on ‘experience’ and not upon ‘fixed principles’. For a Pragmatist, the Value of an Idea is borrowed from its Meaning and its consequences. Pragmatist derives truth by using the principle of validation which involves an investigation of the proper methods of procedure. Pragmatism claims that the fact of knowing includes information as to how the fact is known. For the meaning and the truth of any idea are functions of its practical outcome, all principles are to be regarded as working hypotheses and the principles may be changed as new information based upon experience becomes available. Thus pragmatists hold that truth is modified as discoveries are made and truth is relative to time and place and the purpose of inquiry. In the last few decades, medical experts have changed their opinions several times while discussing the relationship between human nutrition and health or well-being. Pragmatism prefers to determine the meaning and the truth of all concepts by their practical consequences. 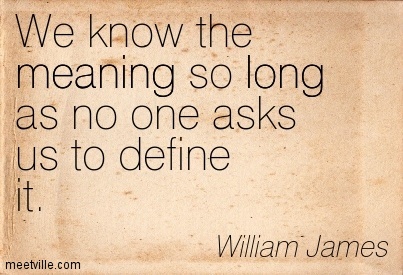 William James stated, “True ideas are those we can assimilate, validate, corroborate, and verify.” For James, true ideas are useful “leadings”, they lead through experience in ways that provide consistency, orderliness, and predictability. Scientific knowledge provides the knowledge to state something is true by sharing the reason why it is true. 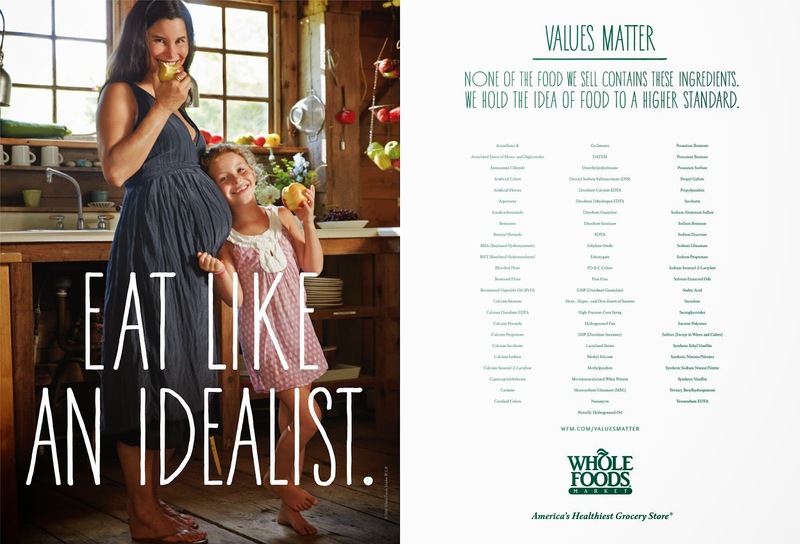 WHOLE FOOD – WHOLE IDEALISM vs PRAGMATISM : WHOLE FOODS CAMPAIGN TO ADVOCATE “EATING LIKE AN IDEALIST” AND THE CONCEPT OF “HEALTHIEST GROCERY STORE” MUST COME WITH A DOSE OF PRAGMATISM. WHOLE FOOD – WHOLE IDEALISM vs PRAGMATISM: A PRAGMATIST WOULD TEND TO DEMAND THAT WHOLE FOODS MUST DEFINE THE TERMS LIKE FOOD AND LIFE IF IT WANTS TO CLAIM TO BE AMERICA’S HEALTHIEST GROCERY STORE. The word ‘pragmatic’ (Latin. pragmaticus means skilled in business or law; Greek. pragmatikos, pragma means business) is concerned with actual practice, everyday affairs, being practical and etc., and hence not with dogma, doctrine, or speculation. 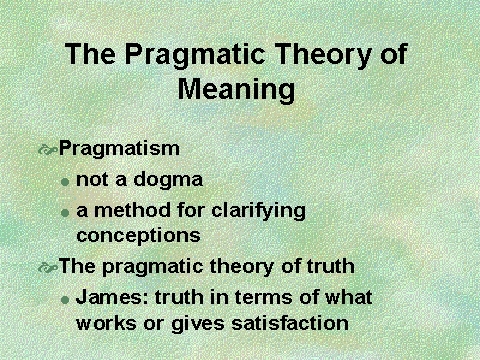 In Linguistics, the branch called ‘Pragmatics’ is concerned with meaning in context, or the meaning of sentences in terms of the speaker’s intentions in using them. I would invite my readers to join in this conversation and I submit that the truth of an idea(“Healthiest Grocery Store”), or action(“Eat like an Idealist”) should be judged in terms of its outcome in practical human experience. 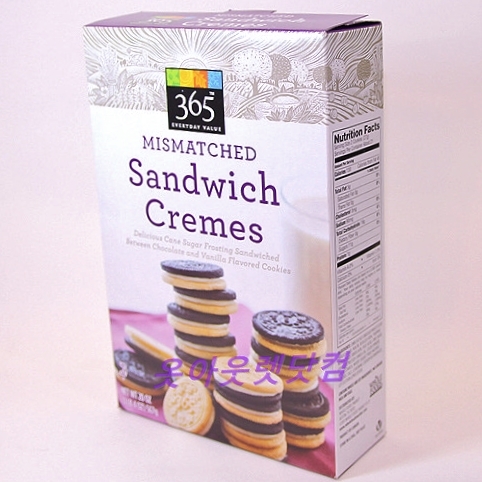 WHOLE FOOD – WHOLE IDEALISM vs WHOLE PRAGMATISM : WHOLE TEAM MEMBERS WHO SHARE THEIR VIEWS ON IDEALISM vs PRAGMATISM WILL GET THIS WHOLE GIFT(365 EVERYDAY VALUE MISMATCHED SANDWICH CREMES). MILK NOT INCLUDED.